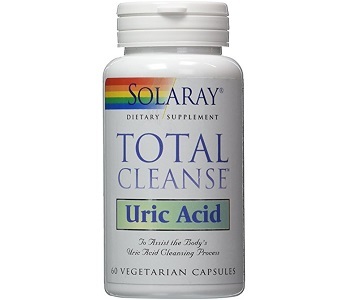 The following is a review of the dietary supplement Total Cleanse Uric Acid, by the manufacturer Solaray. It is claimed that this product is a rich source of vitamin C. Additionally, it is claimed that this product assist to cleanse the body of uric acid. 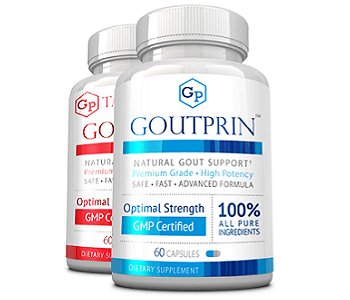 Consequently, this dietary supplement may be used to control gout by managing the uric acid levels. Two capsules contain will provide the following, namely vitamin C (as ascorbic acid) (100 mg), folate (as folic acid) (400 mcg), tart cherry (prunus cerasus) (fruit concentrate) (supplying 3.2 mg anthocyanins) (400 mg), bromelain (from pineapple stem) (supplying 625 gdu) (250 mg), quercetin (250 mg), turmeric (curcuma longa) (root extract) (supplying 190 mg curcumin) (200 mg), and celery (apium graveolens) (seed extract) (supplying 85 mg phthalids) (100 mg). Other ingredients present in these capsule are vegetable cellulose capsule, cellulose, silica, and magnesium stearate. This product has a diuretic property, supporting in lessening of uric acid in the blood. The celery as well as the vitamin C absorb the uric acid from the blood, in so doing dropping the concentration of uric acid in the blood. Components such as turmeric have an anti-inflammatory outcome on the body; tart cherry and quercetin eliminate contaminants, and bromelain comforts joint discomfort. Firstly, this supplement should not be used if a person has a bile duct obstruction, gallstones, stomach ulcers, or even hyperacidity, in additionally if a person is pregnant. Otherwise, the manufacturer’s instruction is to take two (2) capsules with a meal or a glass of water, daily. Total Cleanse Uric Acid is available on the manufacture’s e-commerce website, but also online on third-party sites. One bottle (containing 60 capsules) has a purchase price of $17.99. This price does not include the shipping fee of $6.95 (only applicable within the US). Purchases over $100.00 do not pay shipping fee. There is a full satisfaction guarantee from the manufacturer, subject to the unwanted goods are returned within 30 days of purchase. That said, a consumer will only receive a refund on one opened bottle that is been returned. Nonetheless, all returns are subject to a 20% restocking fee. From our research we analyzed the 165 reviews on Amazon, and concluded that 90% of the reviews were of high quality and be trusted. However, it should also be noted that Amazon deleted 14 reviews. Total Cleanse Uric Acid may be used to accelerate recovery after an outbreak of gout, or to reduce the threat of having such an occurrence. This health product is supported by a 30-day refund guarantee policy. The formula is designed to avoid uric acid accumulation while comforting pain and distress. These are the positive aspects of this dietary supplement, conversely, there are uncertainties with this product. For instance, the guarantee policy is misleading. This as there is no actual full money-back guarantee. Every single return attracts a 20% restocking fee. One more concern is the safety of this supplement. Even though it is said that there are no side effects, the maker of this product state that this supplement should not be used by those suffering from numerous health complications, ranging from stomach ulcers, and gallstones, to bile-duct obstruction; expecting women should also avoid taking this product. It would consequently be best to check with your physician before you use this supplement just to be extra safe. To finish, this supplement does not come with attractive buying deals. These, in the form of discounts, would have made this product more cost-effective in the long run. Particularly in the case of gout that can’t be cured, but should be effectively managed to avoid alterations in the joints and to lessen the pain in the course of a flare-up.